I am so thankful for my husband! I always realize just how much during times like right now, when he is gone for weeks and I have to try and keep up manage without him. He really helps so much around our home. 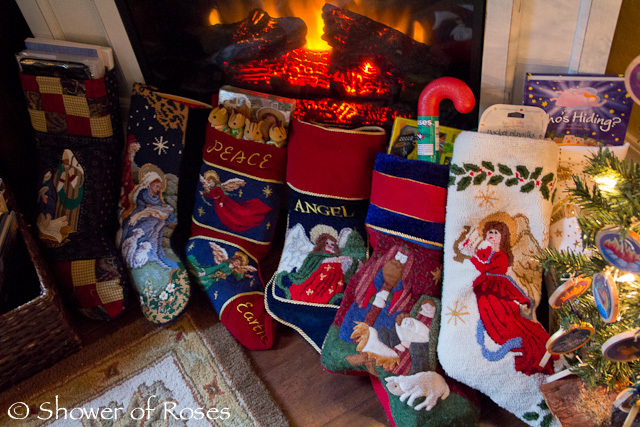 I was so exhausted, and not feeling very well, following Midnight Mass on Christmas that he told me to just rest while he took care of filling all the stockings, setting up the rest of the nativities, laying baby Jesus in the manger, and placing the children's gifts under the tree. We hadn't gotten home until around 2am and he didn't get to bed until nearly 5am, which was when I woke back up nurse the baby and then snap a few pictures. He did a lovely job and had even surprised me with a new heather grey Christmas nightgown of my own (we always give the kids new pajamas on Christmas Eve) which is so comfy and cozy! We were able to sleep for a couple hours before we started hearing the pitter patter of lots of little feet skipping, hopping, and running down the hallway, while whispering "Should we wake them up?" "No, not yet! They will wake up soon!" and lots of "Merry CHRISTMAS! It's Christmas!!" 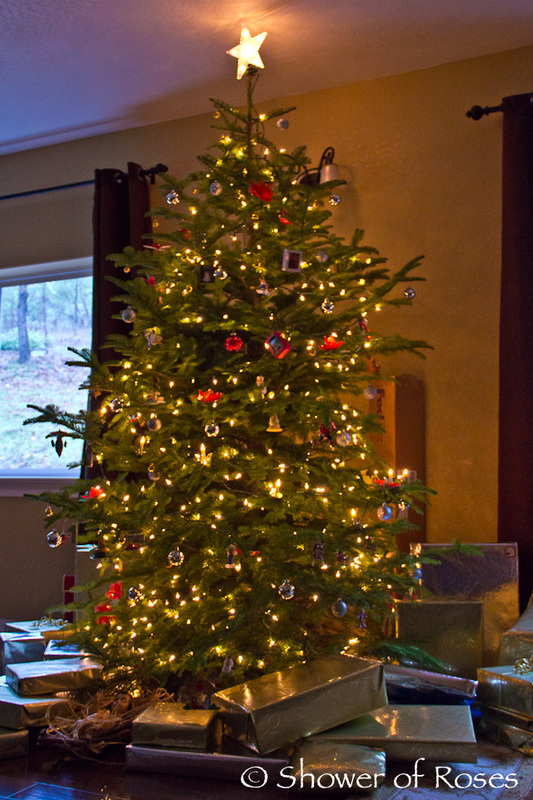 Around 7am, or so, we finally got up and headed straight for the coffee pot out to the family room! We are very selective with the movies that we allow our children to watch, and we have never had TV reception, but we do have a Wii. It was actually my birthday gift one year! I especially love that it is a great way to get the kids to burn off some energy when the weather is too bad to play outside. 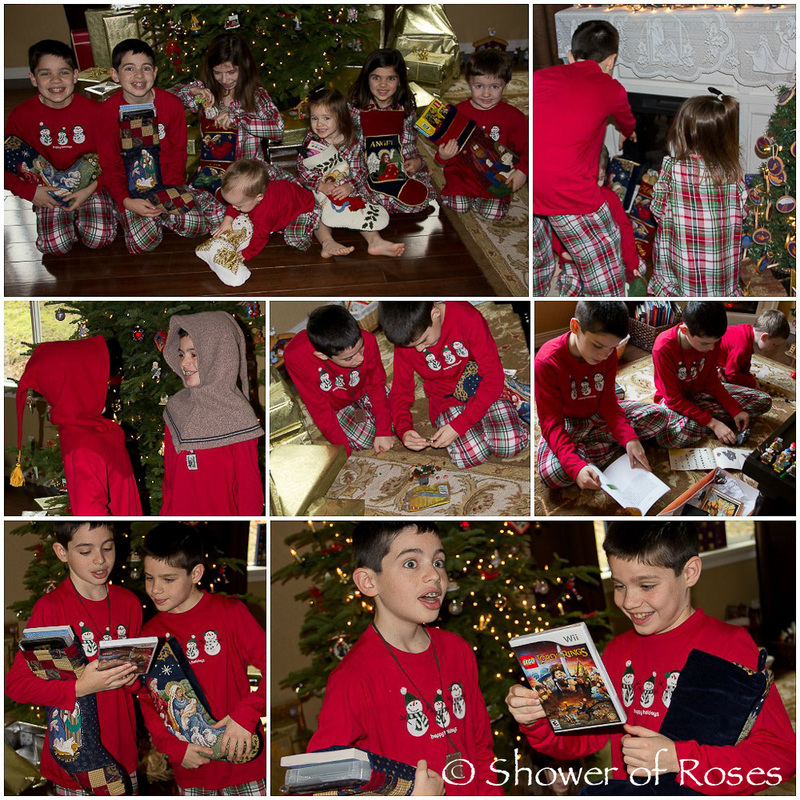 We don't purchase many games, and the boys didn't even know that there was a new Lord of the Rings game... Can you tell how excited the big boys were when they discovered it in one of the stockings? 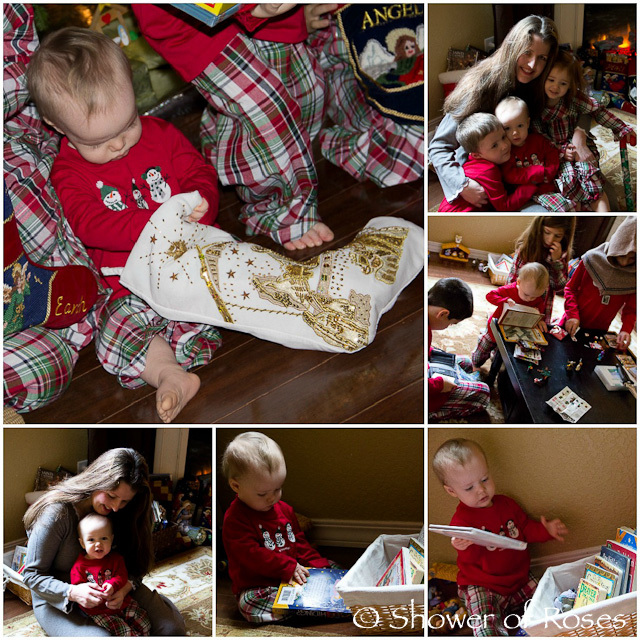 (It was another Black Friday deal we found online!) *One of the requirements was that they listen/read the book before playing the game and that the younger children are not to watch them play. And thanks to all the wonderful suggestions, they also found a couple audio books (Swallows and Amazons and The Hobbit/Lord of the Rings), books (Snow Treasure, Scramble! Tales of the RAF Bk 1, and The Good Master), in addition to dwarf hoods, a few new mini-figures, and a gift card to Yogurt Hut which we ended up using last night! Twinkle Toes discovered the Anne of Green Gables audio, the Calico Critter Furbanks Squirrel Family, The Thirteen Days of Christmas, a pretty pink watch, a Swedish "St. Lucia" Doll, and some Burt's Bees Lip Balms. Chiquita found the Little House in the Big Woods/Little House on the Prairie audio book, the Calico Critter Pickleweeds Hedgehog Family, The Family Under the Bridge, a North America "St. Kateri" doll, new journal, pretty hair clips, and a Yogurt Hut Gift Card. Rose discovered some pretty pink-uh pajamas, Cat Chat: A Christmas to Remember, Calico Critters Wilder Panda Family, Pink Rose Fairy Pocket Playsilk, pink Butterfly Wings, and a Scheilch Lamb and Sheep. As for Snuggles... He was so excited to find a some little lego sets, to go along with the Alphabet Path: D is for Dino, E is for Elephant, F is for Fire Engine, G is for Giraffe. 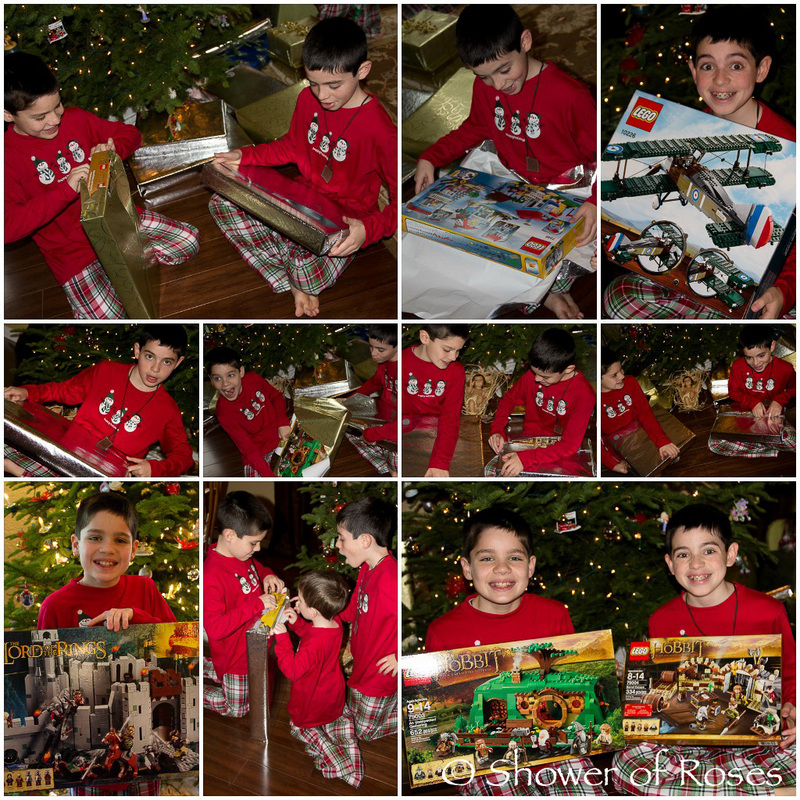 He also received a couple Mini-Figures, Miguel Pro CD, Ferdinand Train, and a few Cars. 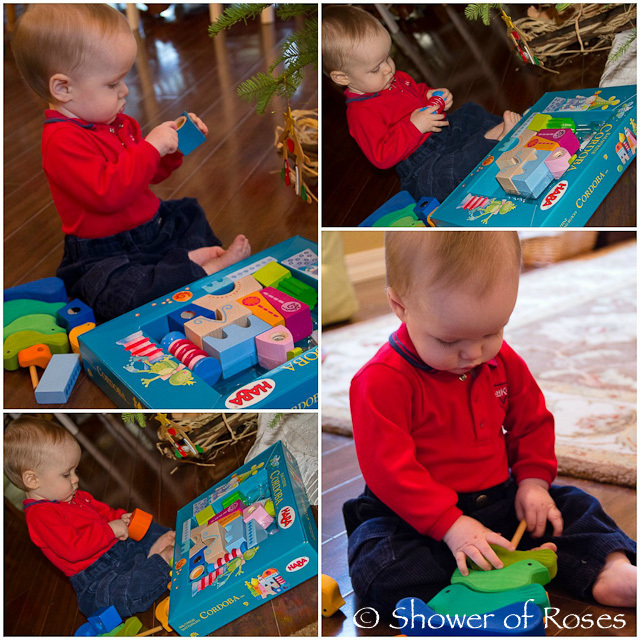 Bud found another board book, fabric book, socks, and bath Toys. 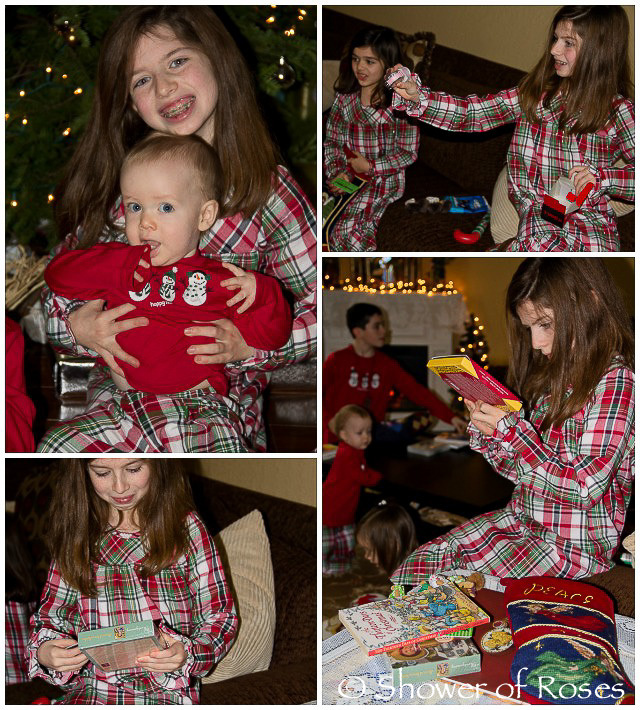 We exchanged our Christkindl gifts before moving on to the rest of the Christmas gifts under the tree! 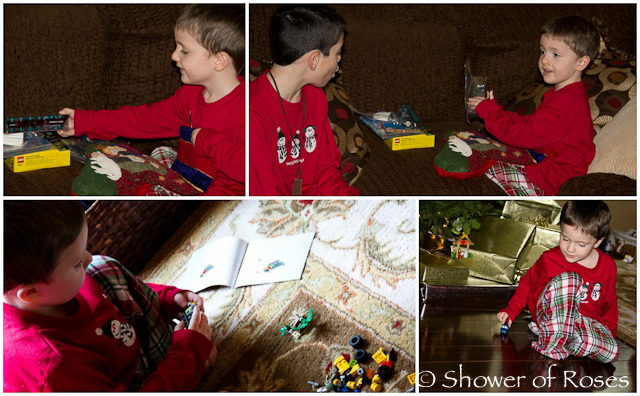 Lego's were the theme this year for the big boys! They can hardly believe that there was a time that they were not interested in Legos, and preferred Playmobil. It helped that they found a few themes that they especially love! We got each of them three sets. Captain received Seaside House (Creator), Barrel Escape (Hobbit), and the Sopwith Camel! Rascal received the Lighthouse Island, An Unexpected Gathering, and Helm's Deep (Lord of the Rings). All of the sets, except for Captain's Sopwith Camel have already been assembled! I'm still working on a system for storing the boy's legos, and am hoping to hang a few more wall shelves in their bedroom soon. Usually the top of their dresser is covered with their creations and others are displayed on their bookcase. The rest are in boxes in the closet. I love Charlotte's Lego Trays, but my boys have under bed drawers, otherwise I would have made some by now! 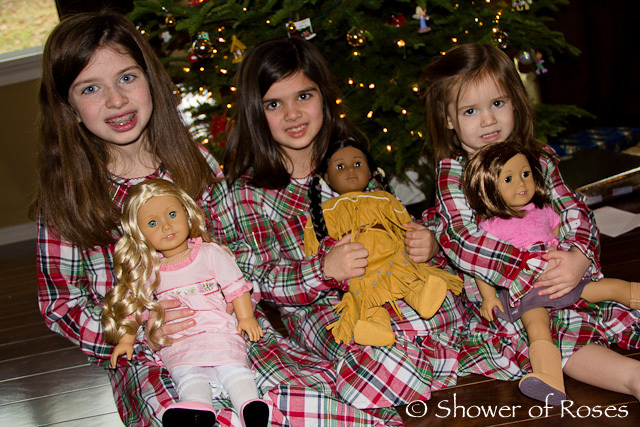 For the girls we knew we couldn't go wrong with American Girl gifts, especially since their History study has revolved around these sweet historical dolls. They each received a couple craft kits: Josefina's Memory Box Kit, Kaya's Weave and Tie Bracelet Kit, Kit's Fabric Flower Kit, and Felicity's Embroidered Pillow Kit. I ordered Chiquita a Josefina outfit and Twinkle Toes a dress like Caroline's. And they were absolutely thrilled to find Caroline, Kaya (St. Kateri was canonized this past year after all!) and even Rose received a Just Like Me dolly, who she calls "Me-uh!" I think we'll name her Mia! The big boys saved and purchased a special gift for their younger brother. He was thrilled! He was also given a Dragon Knights Castle in addition to this Knights Lego Set. 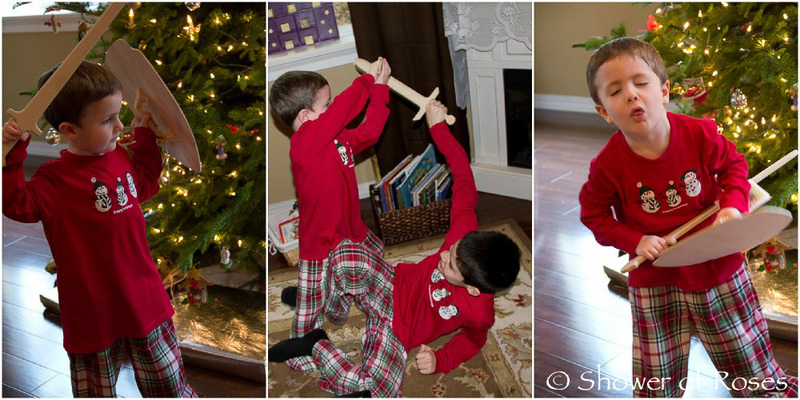 He also received a couple wooden swords and a shield, and immediately the battles began! 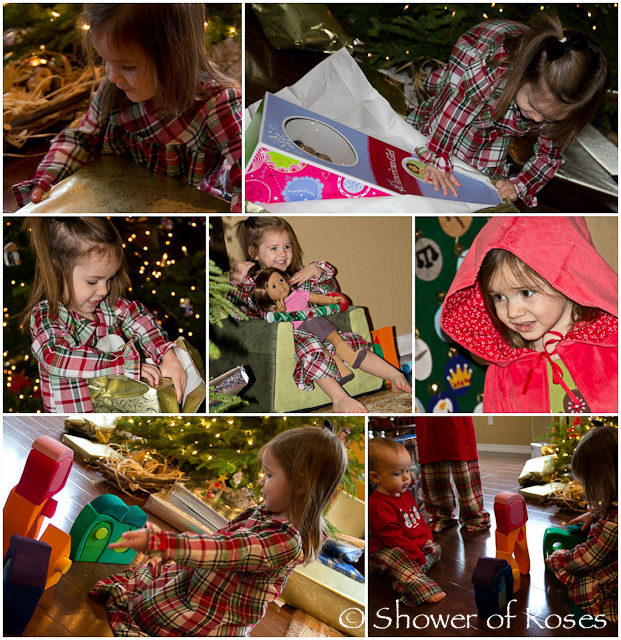 In addition to her new doll, Rose also received the Grimm's Wooden Fairy Tale Village! I've been wanting to buy this for a long time, and finally found an amazing sale on it last fall. I never did have a chance to finish the handmade gift I am making for her, so her third gift ended up being a sweet little Red Riding Hood Cloak that I had stashed away for next year's birthday... I'm considering a Little Red Riding Hood or Fairy Tale theme of some sort! 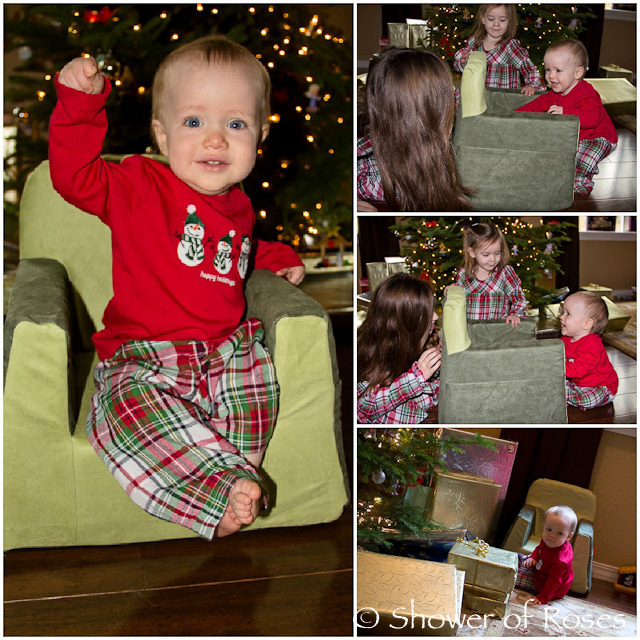 I love Bud's new chair and so do all the kids! 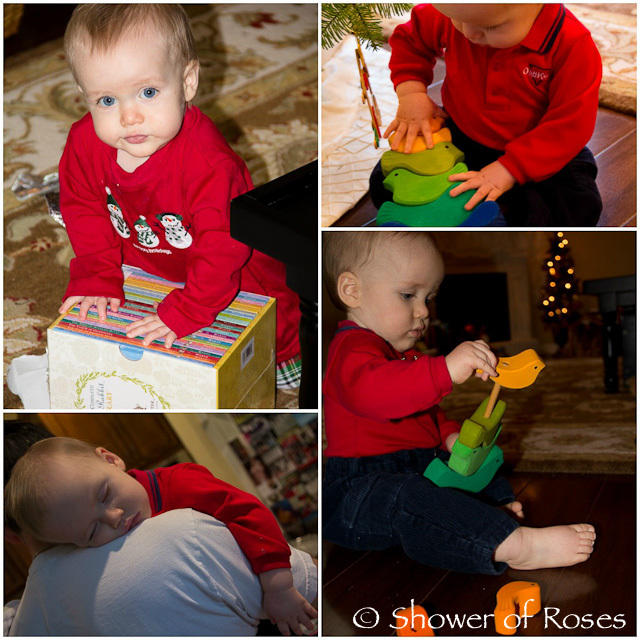 Bud enjoying the gifts from his godparents! 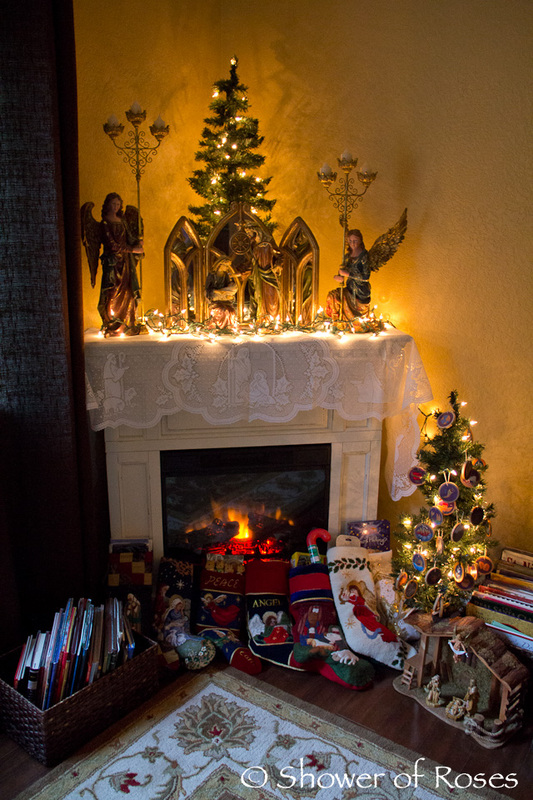 After the children had opened their gifts I put my camera down and didn't pick it up again all day. We enjoyed the day together as a family and, after dinner, we drove out to my parents to deliver gifts and see more of my visiting siblings. It was such a beautiful blessed day, and just the beginning of our celebrations for the Twelve Days of Christmas and the whole Christmas season! Before I comment on your Christmas morning, I have to tell you how much I love the new buttons you've designed - they really look beautiful in your layout. Since I'm the world's worst at design and blogging technology, I'm always impressed when another blogger adds something original and clever to their blog. I love your Christmas morning post, we also did Midnight Mass and didn't get home until after 2am. We actually took 2 vehicles to Mass and my husband came up with a 'mock' need to run home (in order to have seats we have to get to Mass no less than an hour early so he still made it back in time for Mass). 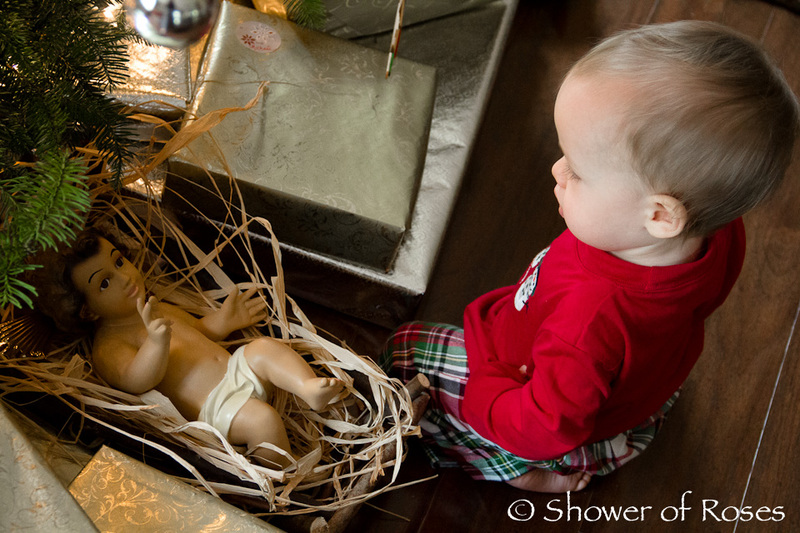 He set out everything so that when we arrived home from Mass, Christmas had arrived. We even surprised the older boys and that is HARD to do. 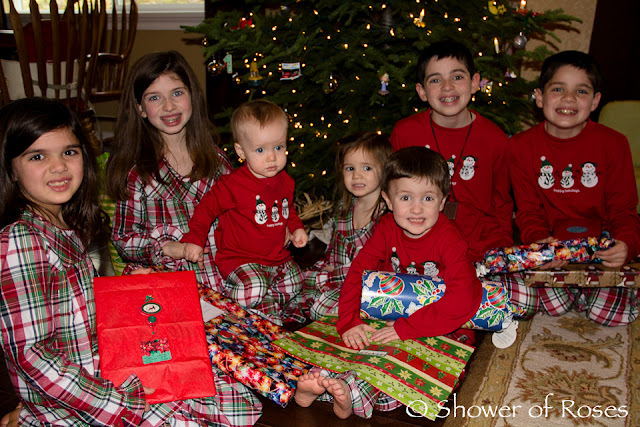 Your kids look darling in the pj's and look as if they had a very Merry Christmas morning! 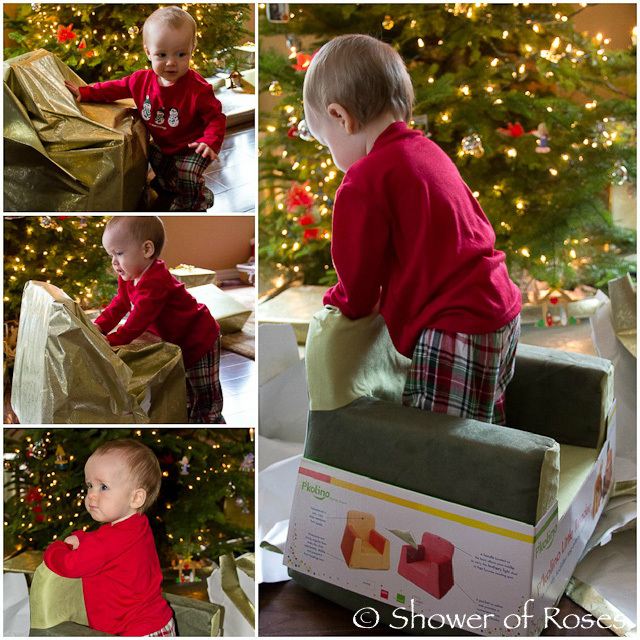 Your Christmas Eve and Early Christmas Morning sound wonderful! We, too, had to take two cars, but only since my husband had to go early since he was singing with the choir! Thankfully one of my sisters went with me to help with the kids. 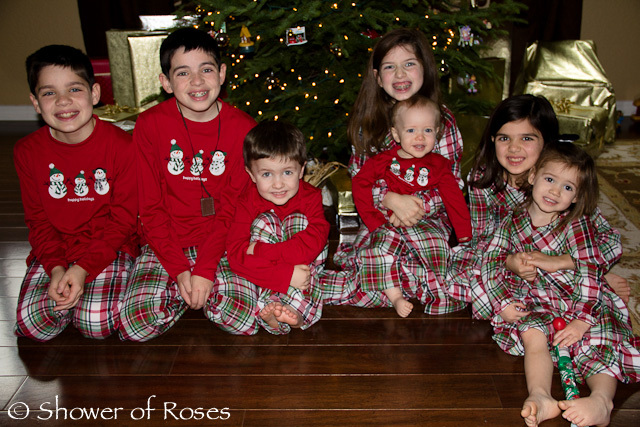 I can usually manage at Mass on my own with all the kids, but not at that hour, with this many little ones! Your husband really is a great guy. It's usually around Christmas Eve that I start to think, "Why do I always have to do all of this myself?" I did a very poor job training! 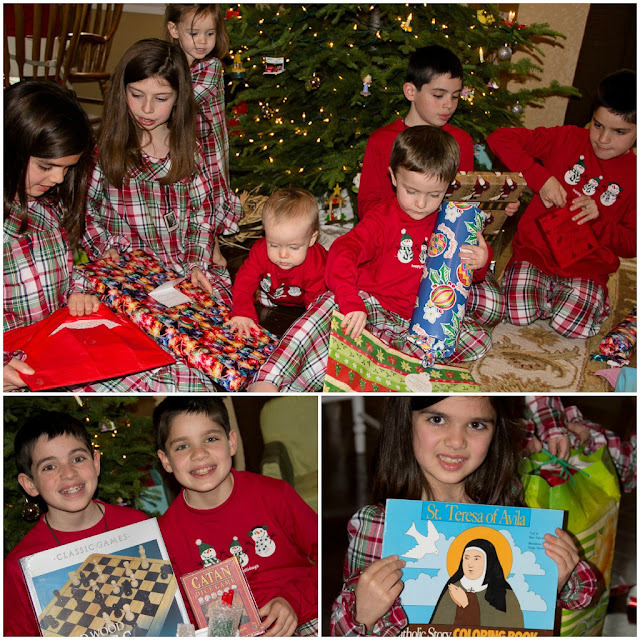 A wonderful Christmas and a beautiful family! Praise God for your beautiful family and abundant gifts (not the wrapped ones). Prayers for a joyfilled new year. P.S. your blog design looks great! So many beautiful pictures! What a lovely, joyous morning it was! 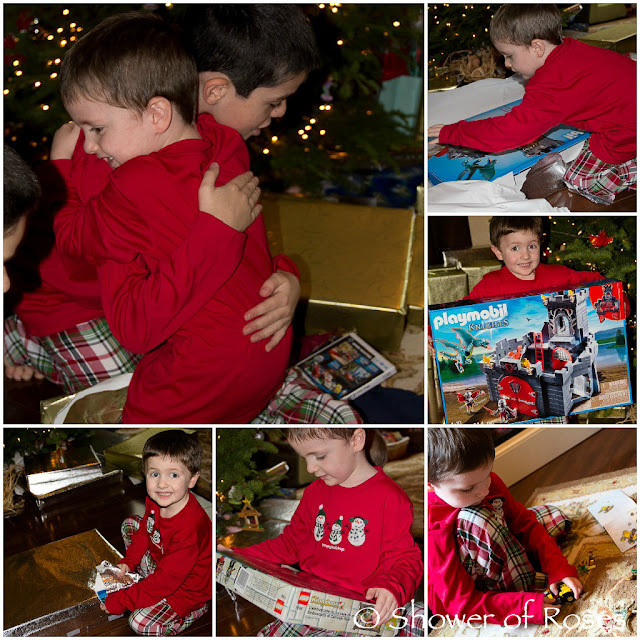 You chose such thoughtful gifts and the children look so delighted and appreciative of them all. You mention being selective with movies (naturally) - have you seen The War of the Vendee? We all just watched it last night (for the fourth time) and enjoyed it so much yet again. I think your family would really enjoy it - the scenes of Holy Mass are especially beautiful. We have not see it yet, though I have been meaning to purchase it for some time now! I'm hoping that I can include it in one of the Easter Baskets this year. :) Thank you for the recommendation! Speaking of Easter.... Do you have or know of a lace table topper that would suit the Season??? 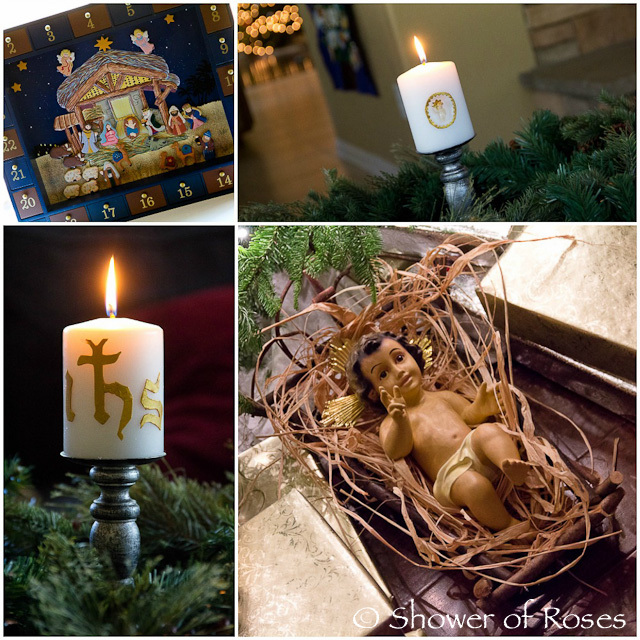 I LOVE the "Silent Night" one (got one for our home, too!) and was looking at Heritage Lace's collection this afternoon, but didn't see anything specifically "Easter" - lot's of flowers (a couple of rose ones would be great for Valentine's and St. Therese!). PS - also looking for something for Lent - can't seem to find anything for table toppers - in something purplish or vine leaves, etc..... Any thoughts???? I found this at Heritage Lace - "The Last Supper". It's a 72" round table topper (too big for anything I have). I have always used a simple plain purple table cloth for during Lent and then a White, Ivory, or Gold tablecloth for Easter. This year, since we've added all the leaves to the table I need to start looking for longer replacements. I do like the solid tablecloths we've used for these feasts, since I usually have lots of other decorations on the table - candles, statues, etc. Still, I will try and share if I run across anything! Thanks for the thoughts and thank you for sharing if you come across anything in the meantime! I was looking last year for something for Lent and just never found anything - ended up getting a 17" napkin that I used unfolded under the vine wreath of thorns centerpiece.... It works, but a bit on the small side - was hoping for something a bit bigger. Thankyou for sharing these delightful photos. Happy days to you.- Valerie, NZ. 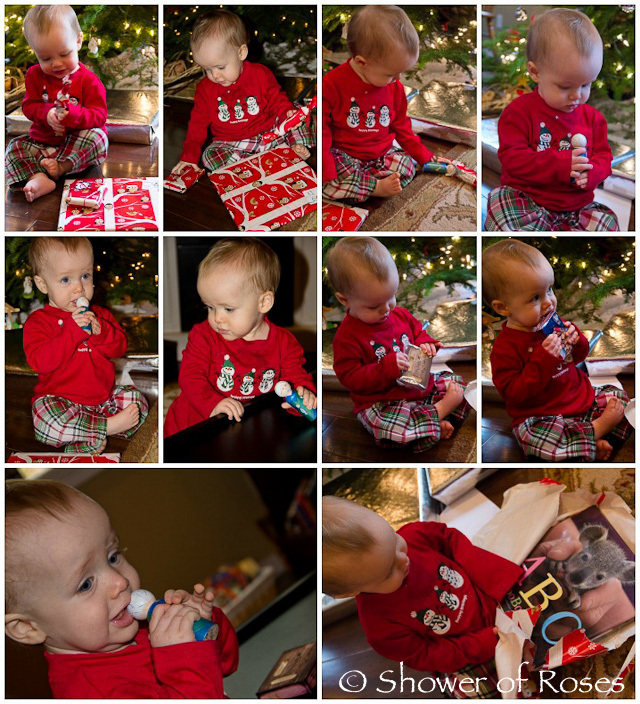 I want to thank you for posting in such detail the gifts your children receive. Your children have very similar interests to mine and your posts are so helpful for great gift ideas! Looks like a great Christmas morning. Samuel wants all of Snuggles' gift for next Christmas--he's already planning! One day I will have to send you some pics of the dollhouse I made for Mary Catherine for her mini dolls. It was a great effort for me, but I'm sure you and Sean would have no problem whipping one up. You seem very creative and handy. PS Could you tell me now what you were painting a few months ago for your godchildren? The suspense has been killing me...haha! I'd love to see the dollhouse!